EarthCast is the ultimate solution for aviation weather and flight planning. Our advanced prediction system provides detailed forecast information about weather conditions and flight hazards over the entire globe. Finally, accurate and detailed forecasts are available for every region of the planet providing critical information about weather and flight hazards including clouds, winds, temperatures, icing, convection, the jet stream and even clear air turbulence. EarthCast provides detailed and innovative environmental monitoring and forecast information. Our use of global Earth observing satellites provides highly detailed and site-specific information for every location on the globe. Our GIS-based products are tailored to provide specific information about the impacts of weather by providing historical context through day-by-day assessments, historical analysis as well as extremely accurate forecasts. Please fill out the form to the right to request access to additional demo content, including our Interactive Global Prediction System. We are happy to walk you through our demos and discuss our monitoring and prediction solutions. Our sales team will review your request and get back to you shortly. If you would like to contact us with direct questions or to set up a live demo, please visit our Contact Us page. Members click on the map below to access the EarthCast Global Demo. EarthCast® is the ultimate solution for aviation weather and flight planning. 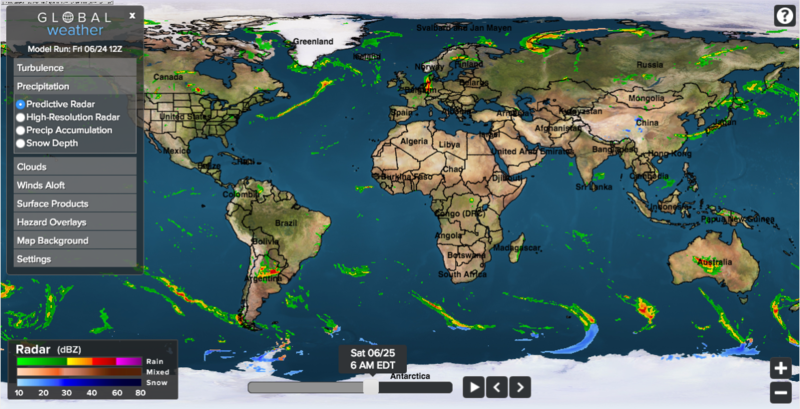 Our interactive global prediction system provides detailed forecast information about Turbulence, Precipitation, Clouds, Winds Aloft, Surface Conditions, and Hazard Conditions over the entire globe. Click here for a demo of this tool. EarthCast combines the latest forecasting technology with high resolution satellite observations in near real time to produce HyperLocal predictions of environmental hazards. When seconds count, EarthCast provides critical information to decision makers about hazards of all kinds, whether man-made or natural. The grand environmental challenge of this century is water - whether too much, or too little. And, the ability to predict when and where it falls and where it goes is crucial. Flooding and droughts kill more people than any other weather disaster and result in billions of dollars in damage every year. EarthCast provides water management solutions for both domestic and international customers world-wide, even where ground-based instrumentation is sparse - or doesn't even exist. Weather. Water. Land. Know The Future.